Megh Wingenfeld is a flower farmer, blogger, stylist, and creative based out of Cleveland and Brooklyn. A farmer for her whole life, Megh officially went into the business of flower farming four years ago. She grows all of the flowers she works with, and offers floral arranging for events, weddings, and styled shoots, as well as educational events and workshops. 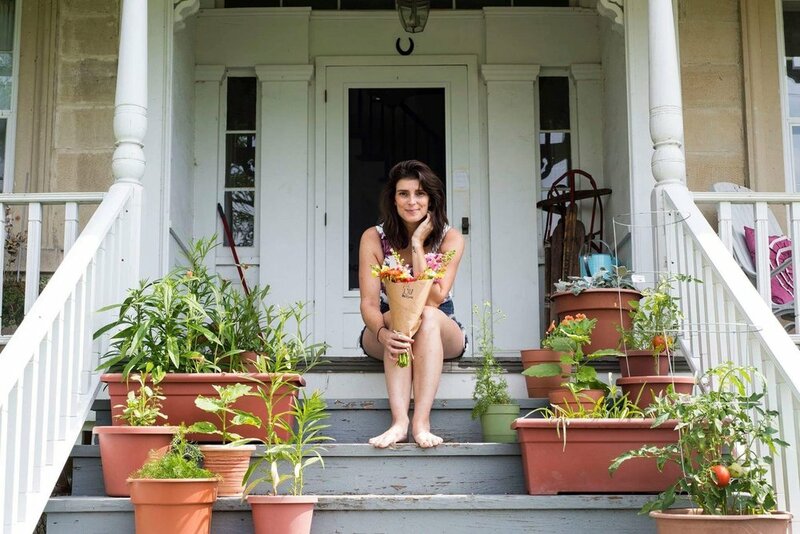 On her blog she shares farming tips, wedding stories, recipes from her garden, and styling. Her flowers and floral arrangements have been featured in Arhaus The Blog, styling in Good Housekeeping, and a write-up about her farm in National Geographic. “My work will always be rooted in agriculture and focused on seasonal growing and sustainability,” says Megh. We asked Megh how being a flower farmer, spending time outside, and interacting with the beauty of nature has made an impact on her life. If you’re anxious for Spring to begin and need a dose of floral inspiration, read on. We spend so much time indoors with our faces buried in screens—even during the warmer months when the sun is shining. As someone who loves working in the yard, I asked Megh how farming has impacted her perspective. You don’t have to have a farm to experience that connection with nature. Even just working in your yard or planting a container garden can have an effect on your psyche. I can personally attest to how amazing it feels to plant bushes, flowers, vegetables, herbs, or shrubs in your yard and to watch them flourish. Even tending to weeds and pruning can be relaxing. Megh, of course, agrees that gardening can be a great pastime for anyone and everyone. I’m a big houseplant fan, and have found a lot of success with simple plants like pothos, monstera, and snake plants. All three are great for low light situations. This houseplant guide from Better Homes & Gardens is a great resource and includes information on propagating, watering, and taking care of your plant babies. If you’re into the idea of growing your own food, don’t forget to scale according to your family size. “You only need to feed yourself, not the whole town,” says Megh. Who out there gets way too excited and goes crazy buying every single kind of vegetable at the nursery? (Raises hand sheepishly.) In the height of your garden’s blooming time, that kind of scale ends up being a waste. I’ve let too many peppers and tomatoes rot because of that exact problem. They end up growing faster than you can eat them! Megh explains that almost all of the flowers in the United States are from South America, with most of the American grown flowers coming from California. As Megh puts it, both of those places are pretty far from Cleveland. If you want to grow your own cut flower garden instead of vegetables this summer, Megh has a post all about starting one on her blog. She’s also hosting an educational happy hour on May 24th where you can learn all about planting your own garden, socialize and have a few drinks, and take your very own plant home. You can find information about the Flower Power Happy Hour, and other upcoming events, on her website. What about you, She Leaguers? Are you planning on starting a garden this year? What will you grow? Leave us a comment below to share, so we can all look forward to Spring together! Feature photo by Zac Bubnick.